When 10-year-old Ben Tennyson discovers a mysterious watch, his life is changed forever. Going beyond what you would expect from a time-keeping device, it is actually the Omnitrix, the most powerful gadget in the galaxy, and lends him the ability to transform into 10 extraterrestrial creatures that each have their own superpowers. Cartoon Network relaunched Ben 10 in 2016 and, a year on, that decision to re-imagine the popular animated superhero series has now been met with the first game to accompany it. It is Outright Games and Torus Games that look to create their own adventure in the cartoon universe, which sees Ben, his cousin Gwen, and Grandpa Max continue their cross-country road trip in their motor home, the Rust Bucket. Taking a moment to pitch up a tent provides enough time to teach the player the controls, which hides no particular surprises. The Left Stick is used to move around, and then you can Jump (B Button), Attack (Y Button), and transform (ZL Button), which, in turn, brings up a circular wheel on which you can choose which superpowered alien you want to turn into. Then, you have access to each alien’s unique ability (press and hold the A Button) but this uses up energy that can be refilled by mercilessly punching your enemies. And, knocking them out will power the Omnitrix that, once full, will reward you with the chance to unleash your ultimate power (ZR Button). This soon sees Ben accidentally burn the tent to a cinder as Heatblast, and, confiscating his pocket money for the next six months, Grandpa Max takes them to a nearby town to buy a new one. It can be a challenge to create a game around the constraints of a license, but the script for the cutscenes and general quips in Ben 10 is packed with enough personality and humour to make it feel like you are playing around in an episode of the show. Ben is clumsy and lands himself in trouble, Gwen brings the smarts to help in every situation, and Grandpa Max is often the voice of reason. The villains, too, are great, whether that be the mischievous clown Zombozo who is stealing people’s happiness with a transmitter relay, the selfish and bossy Queen Bee who kidnaps Gwen and Grandpa Max, or the robotic Weatherheads who have conjured a deadly storm that Ben needs to step in to calm. It’s a shame, then, that the gameplay feels so bland. The aliens, which you will steadily unlock as you progress through the story, have all been translated into the game with great care, and feel remarkably different from one another in how they pummel your enemies into submission – whether that be Overflow, Stinkfly, Wildvine, Grey Matter, and the others. But, the actual levels in which they can unleash their powers are dull, reduced to repeated combat encounters where you attacks lack any weight and your enemies fall to the floor all too easily. Ben 10 encourages you to switch between alien transformations with side objectives in each level that rewards you with Alien Boost Points, which are otherwise gathered from smashing objects and enemies into pieces. These can be used to buy upgrades that make them more powerful, whether that be letting their attacks pierce through enemies, increasing their damage output, or seeing enemies drop Chilli Fries when defeated. But, it’s hard to ever care about unlocking them. Not only are the combat encounters easily overcome by simply using your basic attacks, but your time with Ben 10 will be over after less than three hours with little rhyme or reason to play for any longer after the credits roll. There are Sumo Cards to hunt down, but, well… what’s the point? 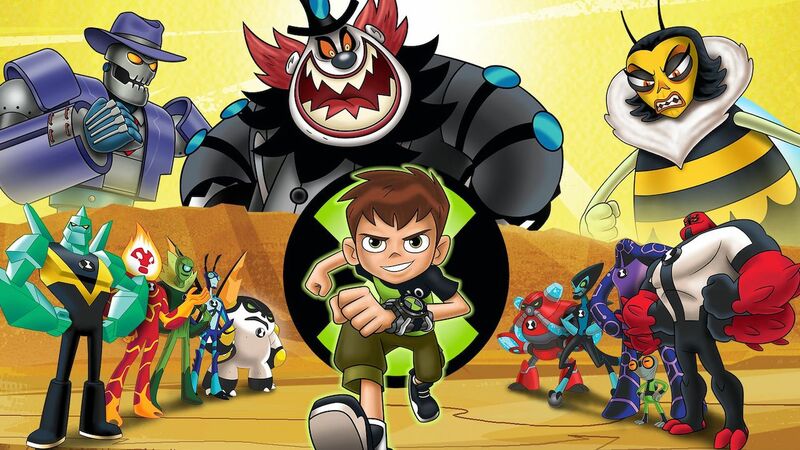 I worry that even fans of the show will be disappointed in Ben 10, which is a competent game, but one that never sparks any excitement, is far too short, and squanders the chance to be something greater. Being a hero can be hard work, we’re told, and it’s difficult to disagree when we’re left to suffer through games with such blinding shortcomings.